The breathtaking décor boasts a spectacularly tall copper & bronze ceiling, whimsical murals and an elaborate Venetian-style balcony, all set in a lovely Tuscan inspired setting. With our winning combination of warm and impeccable service, simple yet creative dishes and a passion for detail, Rocca Ristorante is the perfect place for your next dining experience. Wine connoisseurs will be impressed with the extensive collection of Italian and domestic selections. 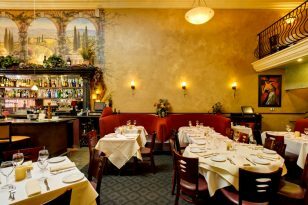 Ristorante Rocca or Open Table Online Reservations.